Jeanne used the sailboat image from our By The Sea set, along with a wonderful sentiment from our new Cherish The Memories Nested Sentiment set, to create this work art! "I love, love, love the By the Sea set! What a great stamp set for so many different types of cards. This is a 5” x 5” card. I made a background panel in cream cardstock and sponged the edges with brown ink and then stitched on the sewing machine with black thread and attached it to the card back. The light blue panel was cut with a Spellbinders Labels 10 Nestabilities® die. I sponged the blue panel and added doodles around the edges with a Copic Multiliner pen." "The image panel was stamped in black on white cardstock and colored with Copic markers. I sponged the edges in brown ink and distressed a bit before attaching to the brown Spellbinders Labels 10 Nestabilities® mat. I wrapped the hemp around the card and knotted and then added the image panel with foam squares. The “Make a Wish” phrase was stamped (with my new FABULOUS Clear Horizontal Stamper!) in black ink on a small strip of white cardstock. I trimmed two “V” shapes from the ends (it helps me to mark the center on the back to get an even cut) and then sponged the edges in brown ink. I curved it a bit an secured with glue. The last step was adding the pearls and gold nailheads with dabs of Ranger Glossy Accents." 7. Tell us who is currently your favorite paper company: "Jillibean Soup – I just love their crisp clean patterns." 8. Tell us what are you currently addicted to: "Ha – That seems to change weekly! My latest addiction seems to be JustRite stamps … my collection has grown huge in the last few months. Yum!!!" 9. Tell us your favorite paper crafting season and why: "I’d have to say Christmas (though Halloween is a close second). Christmas seems to be the time that I’m most creative and working on a variety of projects that I don’t normally do the rest of the year." Well, Jeanne (and the rest of you!) … you are in luck with your love of Christmas stamps, since our Christmas Collection Release One begins shipping tomorrow! Many thanks to Jeanne for sharing her wonderful talents with us this week … please be sure to leave Jeanne some love in the comments below, telling her how much you enjoyed her creations this week! 4. Tell us where you do your stamping: "I have a studio in the basement … My own little toybox!" 5. Tell us what is your must have stamping tool: "Copic markers (easy question!)." 6. Tell us how long have you been blogging: "My first post was Febuary 11th 2007." "This is a 5" x 5" card. After folding the card back I added a strip of light orange and made a little banner from a skinny strip of orange cardstock by nipping a “v” shape out of one end with scissors. I added dots with Copic Opaque White paint (and a pointy toothpick). The border from Plant a Little Love was stamped on light orange cardstock with black ink and cut with a Standard Circle Nestabilities® die and then matted on an orange circle. I stamped the flowers from the My Garden set on white cardstock in black ink and colored with Copic markers." "I cut the image (leaving a small border in white) with scissors and attached it to the matted border circle with foam squares. I finished the project by attaching some coordinating buttons." What a refreshing color palette and wonderful layout! Please check back tomorrow for Day 3 with Jeanne! Please Welcome Guest Designer Jeanne Streiff! 1. Tell us where you live: "Central Texas." 2. Tell us about your family: "I’ve been married for 25 years. We have 4 boys (all grown… whew)!" 3. Tell us how long you have been stamping: "5-½ years. I’ve been coloring since I could hold a crayon!" "I stamped the pretty flower border from Plant a Little Love directly on the white panel in black ink and colored with Copic markers. I used the same border on the brown panel, stamping it a couple of times to create an interesting pattern, and then colored with Copic markers. The sweet flower image (Plant a Little Love) was also colored with Copic markers. After coloring, the flower image was cut with a Spellbinders™ Standard Circle die and then popped up with foam squares." "The “hi” tag circle was made with the Times New Roman Lowercase font and then cut with Spellbinders™ Standard Circle die. I used a simple bow with a button and hemp to finish off the project." I love how these colors pop against the white background and the gorgeous element Jeanne made with the border on the brown cardstock … so creative! We will continue our interview with Jeanne over the next two days, so we hope you'll check back for that and to see more of her fabulous cards! This time, our sketch will be working with oval shapes (you can find our selection of large oval stamp sets HERE and small oval stamp sets HERE). But remember, you are not limited to just using oval shaped stamps – you can cut any of our stamp images into an oval shape to use! Your card or project doesn't have to be related to U.S. Independence Day … these colors also lend themselves wonderfully for any kind of masculine or nautical project. So think anniversary or birthday cards, gifts (maybe an altered frame? ), scrapbook page, or plain old summer fun, too! But also, if you happen to know any military service men or women, it would be fabulous to send your card to them, thanking them for their service to our country. Here's my nautical sample, using JustRite's large oval stamp set By The Sea . . . I think this will make a great birthday card for my brother or father-in-law's summer birthdays coming up! I stamped the sailboat image and colored it with the Copic markers listed below, then die cut the image with a Spellbinders Classic Oval Nestabilities die. Red Copic Atyou Spica Glitter Pen was used to precisely color the rope border. Cuttlebug embossed swirls and tied buttons finish this card. Kathy also used our By The Sea set, combined with a "Happy Birthday" sentiment from our new All Occasion Nested Sentiments set! Click on over to Kathy's blog, Inspired to Stamp, for the full details about her card. Wonderful sentiment and fabulous hand-crocheted stars! You can find out the full details for making Stephanie's card at her blog, Handcrafted by Stephanie. There's a lot of inspiration to get you started! Are you ready to try your hand at the sketch? This week's challenge winner will receive our two newly-released 2" square Christmas stamp sets (From Our House & Hearts Come Home) debuted earlier this week, PLUS a 2" Square Wood Stamper! Honorable Mention winners will each receive a newly-released square Christmas stamp set of their choice! You will then need to link to your project back here on our blog post, using the linking system on this challenge post. Please make certain your link is directly to your project, not just your general blog home page or overall photo gallery, so we can find it easily. (Links that are spam, commercial in content, or are not linked properly/directly to your project will be deleted). If you choose to upload your project to www.Splitcoaststampers.com OR our Flickr gallery, please use the weekly challenge code (example: JRC_024 <== that's an underscore between the letters and numbers) in the keyword section of the Splitcoast project upload page or the Tag section of the Flickr gallery. You will have until next Thursday, July 1 at 9am Central to make your project and enter a link to it below. Then the winners will be chosen and announced a little later that day here on the JustRite Inspiration Blog. By entering our challenges, you grant JustRite Stampers permission to use your artwork here on our blog as well as our company website gallery (with designer credit given and blog or gallery linked) or any possible advertising. We can't wait to see all your sketch projects! Congratulations, Melody! Melody used our large oval By The Sea stamps, for a perfectly coordinated and beautifully colored birthday gift set! Click on over to Melody's blog to see the inside of her card, which contains a gift card and JustRite Just A Note birthday sentiment! Selma recycles the acrylic clamshell packaging from her JustRite stamps and Spellbinders dies and puts it to good use! Cick on over to Selma's blog to see how she created this uniquely gorgeous bookmark, using our large oval Beautiful Blossoms and got very creative with a sentiment from our 2-3/8" ROUND Stitched With Love set! It says "Don't keep me on pins and needles … Just tell me everything" because she is always anxious to get to the end of a good book! What a great combination of two JustRite stamp sets! Hopefully you can see the sentiment in this closeup (left). It tucks into these cute apron pocket cards for gift-giving! Jennifer used our 2-3/8" round Homemade Treats set … very clever! You can find the instructions and other photos of the bookmark over at Jennifer's blog. Gini Cagle also came up with a very unique idea … a bookmark made from a tea bag! Gini made the tea cup gift pocket herself, out of felt! Then she used a stamp from our Baking Centers set, attached to the tag end of the tea bag … very creative! Congratulations, ladies! Please email me your mailing address and we'll have your prizes shipped right out to you! Please check back tomorrow for another JustRite Friday Challenge and your opportunity to win some newly released Christmas stamp sets! Witch Way To The Treats brought out of retirement and now in stock! All of the images above started out being stamped on white cardstock, with all the coloring being added with the Copic markers (colors listed below) … a fun way to customize these stamps to match any kind of project you are making! Stamped in black ink on colored cardstock, the images were punched out and added to the Spellbinders Long Scalloped Rectangle Nestabilities die cut with foam tape, for a quick and easy classic Halloween card! This stamp set is back in stock at our store right now and can be ordered HERE! This is our second Tuesday Tutorial and today's tutorial is hosted by design team member Heidi Blankenship. In this tutorial Heidi will show you how to achieve different inking styles using several tools. Have you ever looked at a card and wondered what kind of technique was used to add the ink to the edges? These are some of the tools you can use for inking on your paper crafting projects. Depending on what tool you use you can get very different results. If you like a bold look then try the direct ink to paper or the sea sponge. The netting brush will have a speckled look and cotton ball will give you a very soft look. For the samples cards I did three different inking techniques: direct ink to paper, sponging and a cotton ball. The cotton ball is my personal favorite, I love the nice soft look. I also left one image without the ink to show you another look. Here is a close-up of the direct ink to paper technique. It is a very bold look. Next is a close-up of the sponging technique. To do this you ink up the sponge and then dab it onto the paper. Here is a close-up of inking with a cotton ball. If you want to achieve a very soft overall look, ink up the cotton ball and then rub in on a scrap piece of paper in a circular motion to blend the ink. Then starting off of the paper in a circular motion work the cotton ball onto the paper. Do you like the look of a nice crisp white edge? 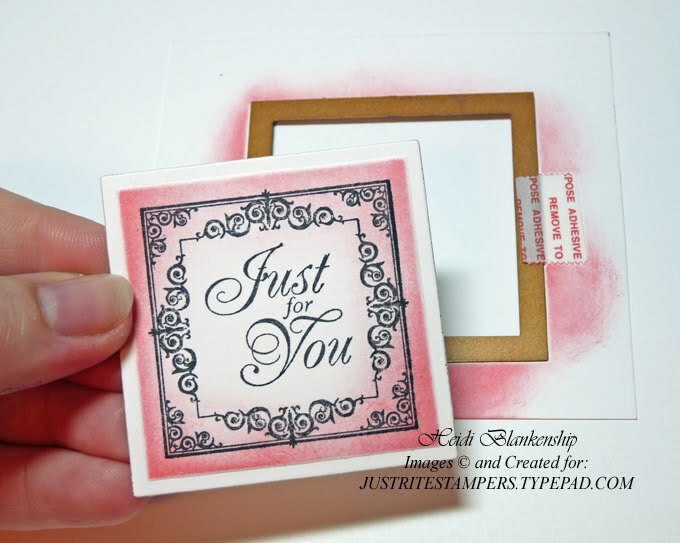 The Spellbinders die templates are made so you can use them just like a stencil. To achieve the white edge look leave your cardstock in the die template after you have cut and embossed and then ink around the inside edges of the die template. When the diecut is removed you will have a beautiful crisp white edge. For my sample cards I used Decorative Frames 2'' Square and Birthday Centers Round along with the 2'' Square Wood Stamper. The diecuts were made using Nestabilities Classic Squares-Sm die 5 and Classic Scallop Squares-Sm die 4 from Spellbinders. I used black cardstock for the base and white cardstock for the mat. The white cardstock was embossed using the Flourish Impressabitites from Spellbinders. I used 3D Foam Squares to add a little dimension to each of the cards. For a finishing touch I added black sheer ribbon and rhinestones. You also might be wondering what kind of ink to use on your projects. Distress Inks by Ranger work wonderfully for inking, they stay wet a little longer and the inks are very easy to work with and blend. You can also use water-based ink and fade-resistant dye ink. When using the dye inks you will have to work a little faster, they stay wet but not quite as long as the distress inks. Chalk ink will have a nice soft result for inking. But I would recommend blending the ink on a scratch piece of paper in a circular motion before going right to your project. No matter what tool I am using for inking I almost always blend the ink on scratch paper, doing this will help to prevent ink lines on your project. We hope this article will be a helpful reference for inking on the edge. Please let us know (by commenting on this post) if there are other questions or tutorials about JustRite's stamps you would like to see answered and we'll try our best to comply! Today I am very excited to share with you 2 New Square Christmas Sets which are designed so that you can mix and match all 12 designs. Both sets are available for pre-order today on our website. 2010 Christmas Collection I stamps will ship on July 1st. For my first card I used the stocking image "From Our House" Stamp Set and accented the card with Holly 1 3/16" centers from the Holiday Cheer Set. You will love how you can mix and match elements from our Christmas Stamps. Notice how the Holly in the designer frame works wonderfully with the Holly Centers from the Holiday Cheer Set. For my second project I combined images from both sets. My Poinsettia image is from the "Hearts Come Home" Collection (I used a designer center and a border for the focal point). I used the Christmas Tree center from the "From Our House" to complete my card design. For this card I wanted a more vintage feel so I used Y0000 to color the background of my stamped images and then I used Antique Linen Distress ink to distess the edges of my stamped images. For this week's Friday Challenge #023, we want you to bookmark it … MAKE a bookmark, that is! While we certainly hope you all have our site bookmarked in your favorite websites, we're talking about the good old fashioned bookmarks used in books! So your challenge this week is to make a bookmark for either a child or an adult and show us your creativity with your JustRite stamps! JustRite design team member, Stephanie Kraft, made this fabulous perforated detachable bookmark card — what a clever idea for gift-giving! Be sure to visit Stephanie's blog to see the front of her beautiful card and to find all the details of how she made it, using the daisy from our My Garden stamp set and one of our new Nested Sentiment sets! My sample today uses our large oval By The Sea set and was a different, fun type of bookmark to make — a corner bookmark! I started with a 4-inch square envelope and just cut it in half diagonally, to form my corner pocket base. Then I just covered the front and back of the envelope with patterned paper. Next, I stamped the shells with Versamark ink onto kraft cardstock and heat embossed the image with white detail embossing powder. I colored the image with Copic markers (colors listed below), including over the white embossed lines. Just be careful when coloring over the embossing, as the markers may deteriorate the embossing powder, breaking it down and possibly damaging your marker tips. If the embossing powder does get on your marker tip, just wipe it off on a scratch piece of paper … I happened to get lucky with mine and it worked out okay! I edged the bottom of my bookmark with Martha Stewart's shell border punch, did some faux stitching on all sides of the bookmark and then tied some crinkled silk ribbon at the top that I hand dyed with Copic Various Ink Refills (R20 & R32) to match the colors of the shells. 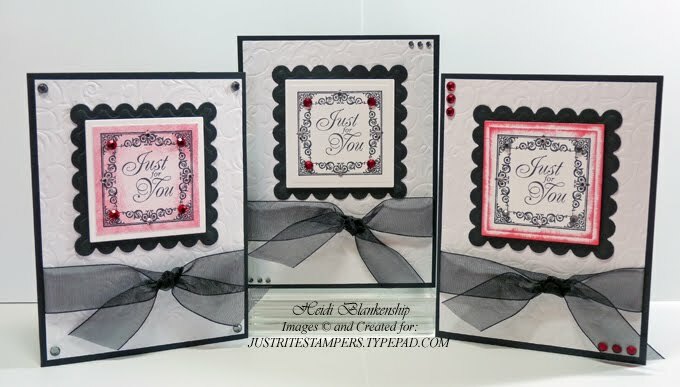 This week's challenge winner will receive a set of our new Clear Horizontal Stamper-(Set of 2) ($23.95 value), Victorian Nested Frames ($14.95 value), All Occasion Nested Sentiments ($14.95 value), for a total package valued at almost $54! Honorable Mention winners will receive a Clear Horizontal Stamper-(Set of 2) - ($23.95 value)! You will then need to link to your project back here on our blog post, using the linking system on this challenge post. Please make certain your link is directly to your project, not just your general blog home page or overall photo gallery, so we can find it easily. (Links that are spam, commercial in content, or are not linked properly/directly to your project will be deleted). If you choose to upload your project to www.Splitcoaststampers.com OR our Flickr gallery, please use the weekly challenge code (example: JRC_023 <== that's an underscore between the letters and numbers) in the keyword section of the Splitcoast project upload page or the Tag section of the Flickr gallery. You will have until next Thursday, June 24th at 9am Central to make your project and enter a link to it below. Then the winners will be chosen and announced a little later that day here on the JustRite Inspiration Blog. By entering our challenges, you grant JustRite Stampers permission to use your artwork here on our blog as well as our company website gallery (with designer credit given and blog or gallery linked) or any possible advertising. We can't wait to see your creative bookmarks! You will absolutely love this fun 1 3/16" Holiday Cheer set. These are the sweetest size stamps. You will find yourself using these stamps for embellishments for cards, tags, and Christmas envelopes!! The images are the perfect size for the center of Spellbinders Shapeabilities Create a Snowflake One and Two dies! Wouuldn't these would be sweet Snowflake tags for Christmas packages . Here's a look at all the adorable images in this set!! For my second project I designed a Christmas tag using DCWV Christmas Gift tags. These come in a box with 3×3 Gift cards and envelopes . I used the pinecone center image form the Holiday Cheer Set to design a paper band for the width of the tag and then used the the same pine cone image with the Merry Christmas Border to create my focal point. Here's a sneak peek of a holly brad embellishment that I made for a Christmas Card in the new JustRite Idea Book using the Holly center from this Holiday Cheer set. To create my brad I used the Chatter Box Easy Bradmaker Starter Kit. This is a super fun kit that comes with 3 punches, 3 sizes of acrylic domes and 3 sizes of metal brads. Simple stamp your image, punch it out insert it in a metal brad frame and them add the acrylic dome.